The TR79 power supply provides a balanced transformer output to an XLR connector and uses an Eveready 357 battery. The battery compartment is designed to permit only one insertion direction, so the polarity cannot be reversed. This compartment is accessible by turning the black plastic end cap counter clockwise and pulling firmly. The battery is removed by pushing it out with a sharp object through the hole provided in the bottom of the compartment. Size: .18" x .300" x .55"
When using the Clip On and Tape Down Holders under clothing, mount the mic with the back out (facing clothing), as the back of the microphone housing has less rubbing noise than the front grid. There will be no reduction in audio sensitivity. These accessories are available in Black, Gray, Tan or white. Positive bias, operates on internal battery or external 12-48V phantom power. Connection between the TR50 and TR79 is through a connector of choice (from an extensive list), matching the connector used by an accompanying wireless transmitter if required. Positive Bias or Negative Bias? What's the Difference? This is an extremely popular question. Click Here for the answer. Cable is intermittent at the connector end of the mic (or where the cable enters the power supply on a hard-wired mic). This is by far the most common problem. The solution is to cut the cable back about 1 inch from the connector and re-install connector. We provide this service for $41 plus shipping with a turn-a-round of a couple of days ($50 plus shipping for hard-wired mics to rebutt the cable where it enters the power supply). We can also replace the connector if it is damaged at that time- connector costs vary from connector to connector. To send us the mic for repair, please complete our Repair Form. 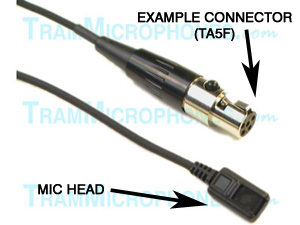 Cable is intermittent (or frayed or pulled out) where it enters the mic head (mic element). This can not be fixed. Any problem with or near the mic head (mic element) can not be repaired. The housing is assembled by a machine at the factory and therefore is not serviceable. Your only solution is to purchase a new mic. We offer the mic only with no case and no clips, and with or without a connector at a lower cost. For mics that are hard wired into the power supply, we can install a new mic head/cable assembly onto your old power supply (the approximate cost to replace a hardwired mic with a new head/cable assembly is ~$229 and you can send it to us using our Repair Form). Power Supply is dead. First make sure you test the power supply with another known "good" mic. Second, make sure the bias of the microphone is the same as the power supply (See FAQs above about Bias). Third, make sure you are using a "good" battery. It is very rare that we see a bad power supply and the cause of the fault is generally one of the items just listed. If you have tried all three of those things and the power supply still doesn't work, then your only recourse is to purchase a new power supply as it is a non-serviceable item. Cable is intermittent or frayed where it enters the power supply on a hard-wired mic. This is repairable, see "Connector" type repairs above. If you are still lost and have no idea whether it can be fixed or not or what component is at fault, you can send us everything and we can figure it out for you! Send in a Repair: To send us your TRAM® microphone for for an out-of-warranty repair, please complete a Repair Form. The address to ship to is on the form. The average repair cost is approximately $45 plus shipping. We suggest you pre-authorize $55, in case we need a few additional parts (new connector, etc.). Please Note that a $22.00 service charge, plus return shipping (if you want it back) will apply to all refused repair estimates. TRAM® microphones are warranted to the original purchaser to be free from defects in material and workmanship under normal use for a period of one year from date of purchase. During this one year period, and upon proof of purchase, your microphone will be repaired or replaced, at the manufacture's option, without charge for either parts or labor, provided the microphone is sent prepaid to the manufacture. This warranty will not apply if the microphone has been misused, abused, incorrectly wired or altered. Warranty repair/replacement does not extend this warranty. For warranty repairs, please contact the manufacture directly or contact the dealer you purchased it from. TramMicrophones.com is not the manufacture, we are only an authorized distributor and therefore only handle warranty repairs on microphones that we have sold. 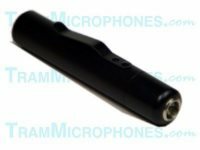 You can order microphones directly from this website. Follow the links below for online ordering.